Some primal instinct to bring garlands and greenery in to the city, to dance and make music, featured in Oxford's Maytime celebrations long before choirs sang the Hymnus Eucharistus from Magdalen Tower. Indeed, that instinct to welcome the summer with green, carnival gaiety even predates any records of morris dancing. The Magdalen tradition is only documented from 1695 when the great diarist of Oxford, Anthony Wood, first recorded the ritual as an invocation to the summer: ‘the choral ministers of this House do, according to an ancient custom, salute Flora every year on the first of May, at four in the morning, with vocal music of several parts. Which having been sometimes well performed, hath given great content to the neighbourhood and auditors underneath’. There is no mention of the Hymnus; nor any suggestion by Wood that church music was sung at all. Rather, May Day was greeted with secular part songs dedicated to Flora, the Roman goddess of flowers. To 17th-century Puritans, reviving the deity was deeply disquieting. They saw Flora as a living reality, a profane heathen goddess come to life in the May Queen. In May the Romans had honoured her with a festival called the Floralia. The country was reverting to paganism! Thomas Hall, in his ferocious rant Funebria florae, the downfall of May-games (1660), rails against Flora as a whore ‘of the city of Rome, in the county of Babylon’. Her worship brought in a pack of ‘ignorants, atheists, papists, drunkards, swearers, swash-bucklers, maid-marions, morris dancers, maskers, mummers, may-pole stealers, health-drinkers, gamesters, lewd men and light women’. It is doubtful whether hymning Flora in Oxford was a custom that descended directly from Roman times. But Flora did appeal greatly to Renaissance humanists who, in their enthusiasm for classical motifs, revived the goddess in both painting and verse. Singing from atop church towers was a widespread custom in Renaissance Europe. Besides Magdalen, New College in the early 17th century had its own May Day celebration. Anthony Wood describes how the singing from New College tower was followed by a procession to St Bartholomew’s Hospital on Cowley Road, with ‘lords and ladies, garlands, fifes, flutes and drums to salute the great goddess Flora and to attribute her all praise with dancing and music.’ The New College ceremony was only abandoned due to clashes with Magdalen men and ‘the rabble of the town’. So, singing from church towers in Oxford did not originally have the character of a Christian celebration, nor was the custom unique to Magdalen College. 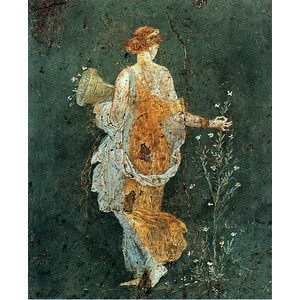 Flora – goddess of flowers – was the focus. 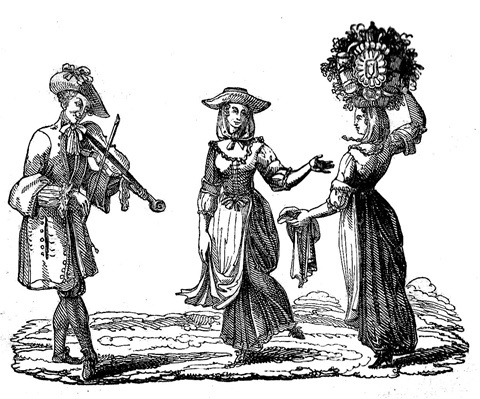 And history records that garlanded maskers and mummers were already a feature of the May revels in Oxford before the singing began. The first of May has been celebrated since ancient times to honour the seasonal rebirth of vegetation. While the Romans had their Floralia, the Celts observed Beltane, and Germanic peoples had their equivalent, known as Walpurgisnacht. Maytime revels were already controversial in the 13th century, though there is no mention of the Morris as yet. The earliest accounts chiefly refer to the practice of going out into the countryside to gather flowers and greenery and ‘bring in the May’. Branches and blossom were used to decorate homes and public buildings, so welcoming the season. Morris dancing was first recorded in England in 1448 when the Worshipful Company of Goldsmiths in London made payments to a harper, a piper and morris dancers to perform at their annual feast. No one knows for sure how it started, but it does seem that the Morris was originally danced as some form of Court entertainment and only later became more widespread as a rural activity, perhaps fusing with local traditions. It is interesting to note the reference to Ascension Day (traditionally celebrated on a Thursday, the fortieth day of Easter). This may fall in May or June, so the revels were not only associated with May Day itself but with more general springtime festivities. In Oxford, beating the parish bounds on Holy Thursday was an age-old custom with which the games were associated. And throughout Britain, they were often celebrated around Whitsuntide, which often falls in June. Confrontations are recorded. 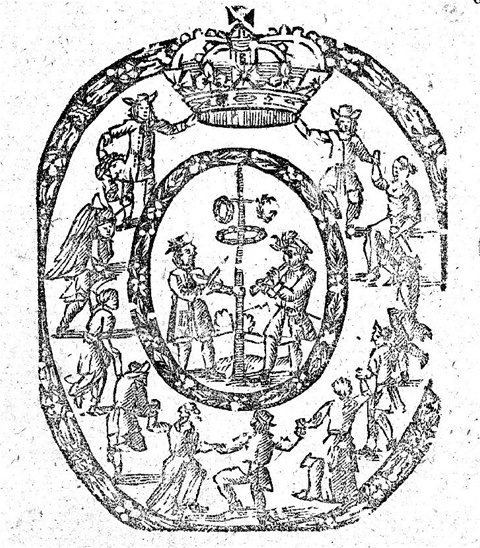 In 1598 there was a May game clash between some youths of the town and the University authorities. The revellers included the mayor’s son, William Furness. In 1617 ‘riding company’ disguised on May Day were held to be in contempt of the Mayor and council. The subversive crew included William Stevenson an apprentice, William Stapler, Frost the cobbler, Peter Short the cutler, Tilcock the painter and Pigeon the chimney sweep. All the riders were put in the stocks for two hours the next market day, with papers on their hats explaining the cause of their punishment. Ironically, all the most vivid descriptions of the Maytime frolics are provided by the Puritan pamphleteers who most detested them. Philip Stubbes in his Anatomie of Abuses (1583) paints a wonderfully lurid picture, describing how men and women, young and old, would run out to the woods on May Eve and spend all night making merry. They returned in the morning with birch and branches of trees, in big crowds. The Maypole seems to have been the focal point for wider festivities, and the ‘summer houses, bowers and arbours’ evoke quite elaborate scenes. The bowers may have been shady retreats in which to chill out; for serving ale; or both. Altogether, accounts irresistibly evoke contemporary preparations for setting up an impromptu rave. A makeshift 'bower' is shown to the right in this detail from 'St. George's Kermis with the Dance around the Maypole' by Pieter Breughel the Younger, 16th century. 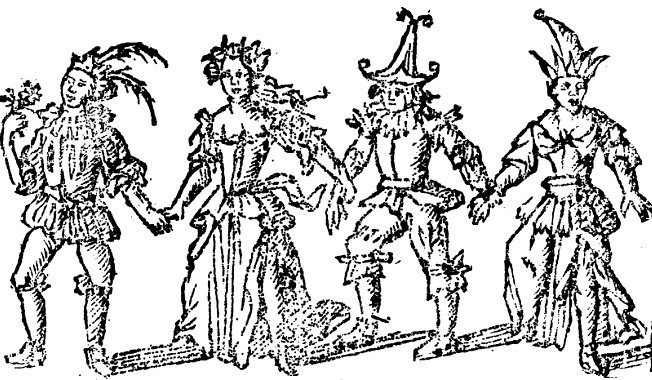 Robin Hood and his merry companions were stock figures in morris frolics. How could the church bring itself to finance them? The explanation can be found in the long tradition of church ales, festivals which had been staged since mediaeval times for fund-raising. The church wardens financed the amusements and sold the ale. Profits then paid for the maintenance of the parish church, or were distributed as alms to the poor. So began a cheery complicity - deep-rooted in many towns and villages - between the parish church and the disorderly revellers. Some parishes even kept their own sets of morris costumes in church to be brought out for their annual Whitsun Ale celebrations. However, John Danvers, Sheriff of Oxfordshire, thought the Puritans too extreme and complained to the Lord Chancellor about the proposed bans. He also ordered the Banbury Justices of the Peace to resist any violent destruction of Maypoles. Legal deadlock was broken when Banbury’s Puritan mob took matters into their own hands by destroying the Maypoles themselves. In response, Vicar Bracebridge’s opponents had him removed from his post. 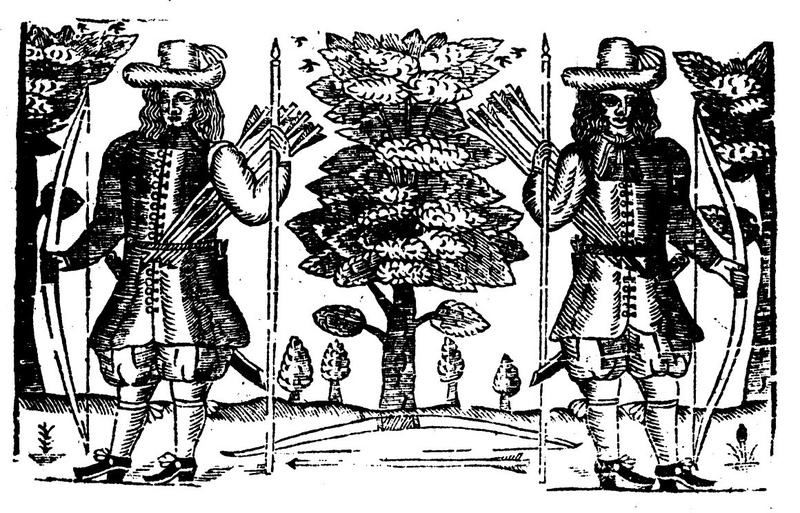 The duel between May revellers and their adversaries continued into the 17th century. Maypoles and morris dancing were specifically mentioned as ‘harmless recreation’ in King James I's Book of Sports (1618), reissued by Charles I (1633). But with a Puritan spirit abroad, many Anglican churchmen also came to denounce the customs as ungodly, and placed local bans on them. In Oxford, Bishop John Howson twice prohibited the morris in his diocese (1619 and 1622); and Bishop Richard Corbet did so in 1629. For a Puritan attack on a garland ceremony in Oxford click on May Garlands above. But this glorious renaissance was not to last. 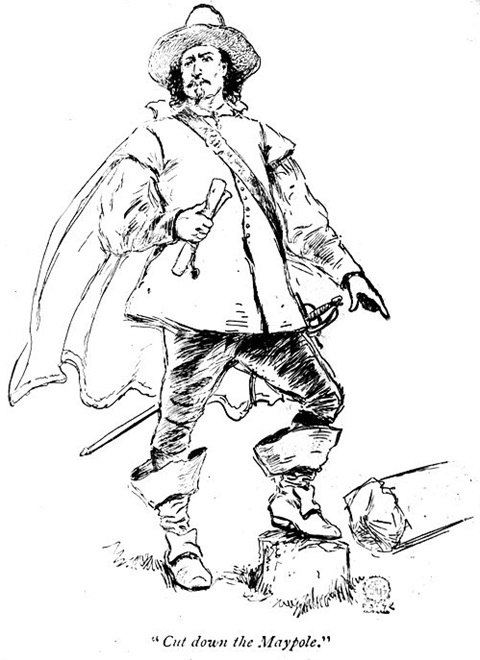 Wood reports that after 1660 the people of Oxford flagged in their zeal for the May revels, although one or two poles still appeared every year. And the morris faced ongoing opposition. Though Charles II, like his father and grandfather, viewed their frolics as harmless recreations, individual churchmen continued to impose local bans on the morris, including two Bishops of Oxford: Robert Skinner (1662); and Walter Blandford (1666). The Puritans might be out of power, but their polemics continued unabated. Besides railing against the heathen Flora, Thomas Hall in his 1660 Downfall of May-games complains that most of the Maypoles are stolen. ‘There were two maypoles set up in my parish; the one was stolen and the other was given by a professed papist.’ The charge of complicity between the heathen morris and abhorrent Papacy is a recurrent theme in Puritan attacks. The suggestion of Catholic connivance can be taken as mere propaganda. 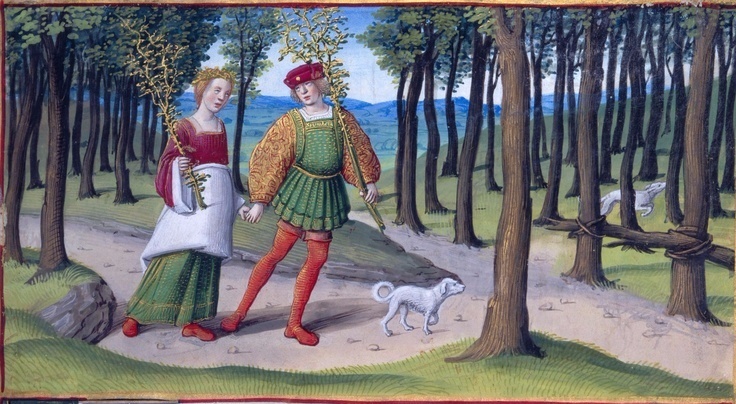 But truth be told, it does appear that Maypoles were often cut from woodlands without permission. It is also clear that whatever individual bishops might say, the old understanding between parish church and May-revellers lived on. The Establishment remained tolerant - or even supportive - of the games (see Maypoles above). 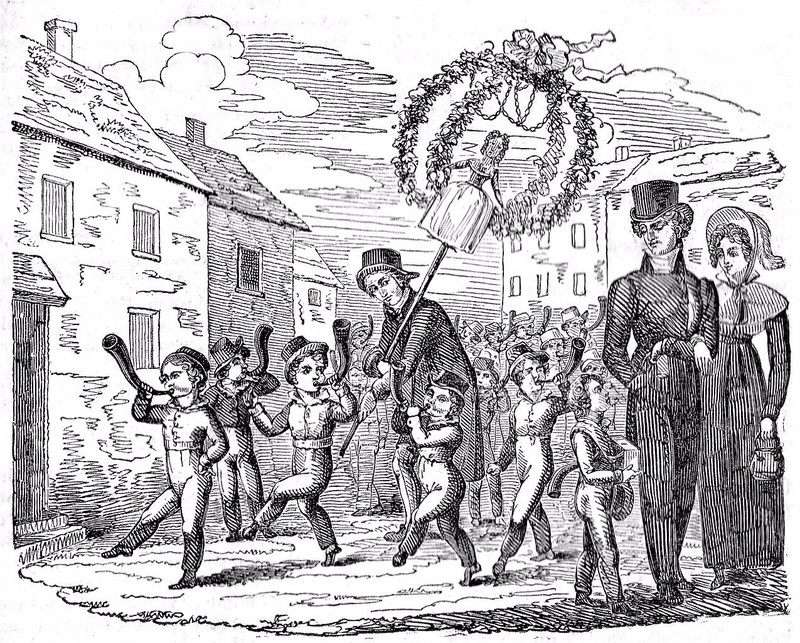 Hornblowers accompany the May garland, from Hone's Table Book of 1827. The setting is Norfolk but it could just as well be Oxford where boys also blew horns on May Morning. 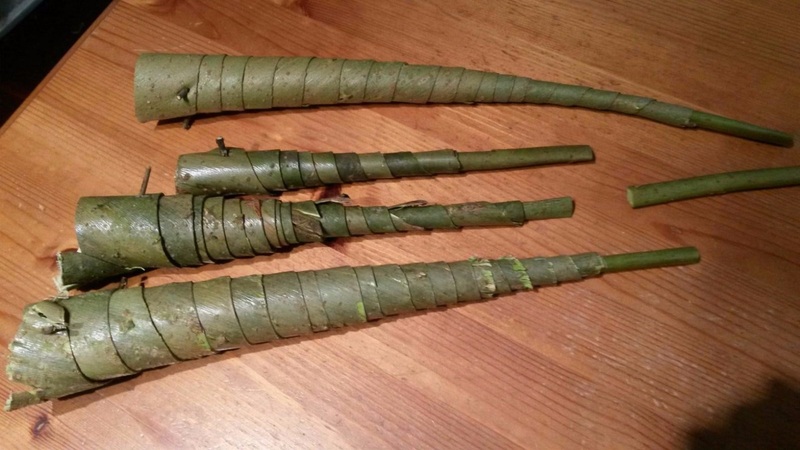 Whit-Horns, recently made from willow bark (modelled from the examples in the Pitt Rivers Museum). They play well apparently. Photo by courtesy of Michael Heaney. Among the most curious instruments in the Pitt Rivers Museum are some Whit-Horns fashioned from strips of willow bark wound into a funnel and fixed with hawthorn or blackthorn spines. The reed was made of bark and the mouthpiece pinched around it to create a primitive oboe. In the early 19th century it was traditional for the Oxfordshire villages of Hailey, Crawley and Witney to celebrate Whit Monday with a hunt at Wychwood Forest. The horns were sounded at dawn to wake the village. Horn-blowing was co-opted into town vs gown rivalry. From about 1800 boys from Oxford were blowing them at the foot of Magdalen Tower to try and drown out the choristers. 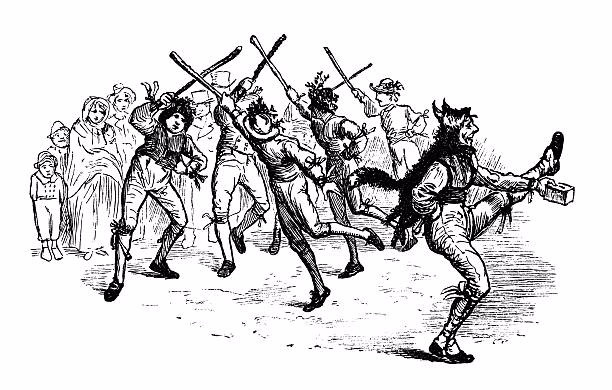 Morris dancers depicted in 1876 by Randolph Caldecott (from Washington Irving's 'Old Christmas'). Though generally declining at this time, the tradition remained vigorous in some English villages. The morris seem to been active on May Morning in Oxford during the 19th century. The Oxfordshire History Centre possesses a remarkable photograph by Henry W. Taunt of a party on Broad Street, May Day 1886, with the eerie figure of a Jack-in-the-Green as the focus of attention (for more on the Jack see The Morris in Oxford). It may be that the morris who appeared on the streets of Victorian Oxford came in from Headington and other surrounding villages. We have no evidence of an Oxford side dancing. What is certain is that May Morning in Oxford changed in the latter half of the Victorian age as Magdalen Tower came increasingly into the picture - and Headington spurred a nationwide morris revival. The long battle between Pagans and Puritans was over. Dancing around Maypoles, morris displays and the election of May Queens - human replicas of the once-abhorred Flora - were all subsumed into the Victorian myth of Merrie England. Three eminent Victorians helped legitimise May Day: Alfred Tennyson with his long poem The May Queen; Holman Hunt with his iconic painting May Morning on Magdalen Tower; and John Ruskin who ritualised May celebrations at Whitelands College in Chelsea, a training college for women teachers who carried customs into the school curriculum. For developments see The Morris in Oxford and Magdalen Tower in the MENU above. For more on Maypoles, The May Queen, May Garlands and The May Tree click on subpages above. 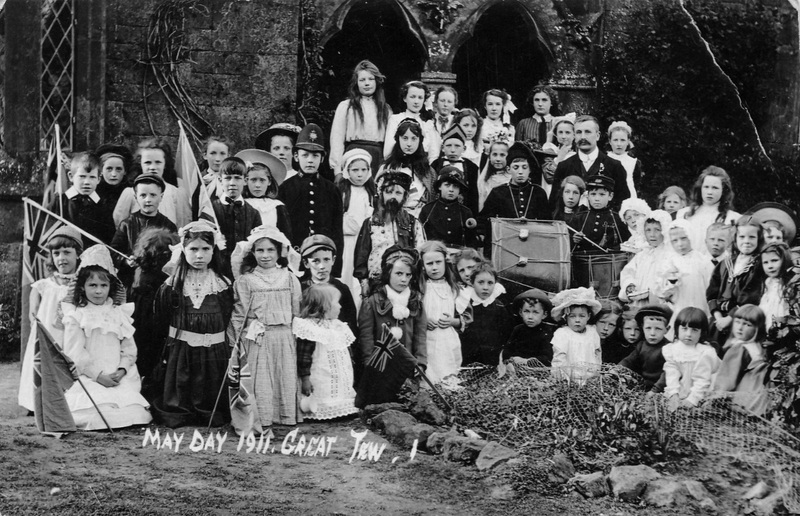 May Day pageantry at Great Tew, 1911. The children pose outside the parish church which now gives its blessing to the revels.